Surprised there hasn't been anything on this. From this weekend, cars have to display the driver number/name more prominently on the cars. I think this is a great improvement. I was disappointed when they dropped/diluted this rule a couple of years ago. Many people (probably most on this board) are able to spot the different helmets/gloves/camera pods to distinguish drivers, but the more casual spectators* can have problems with this - anything to help them is great! Where does it say 'RIC' or 'VER'? I much prefer Red Bull's solution... the larger, clearly visible number. One can see it from a reasonable distance....the name can go elsewhere. 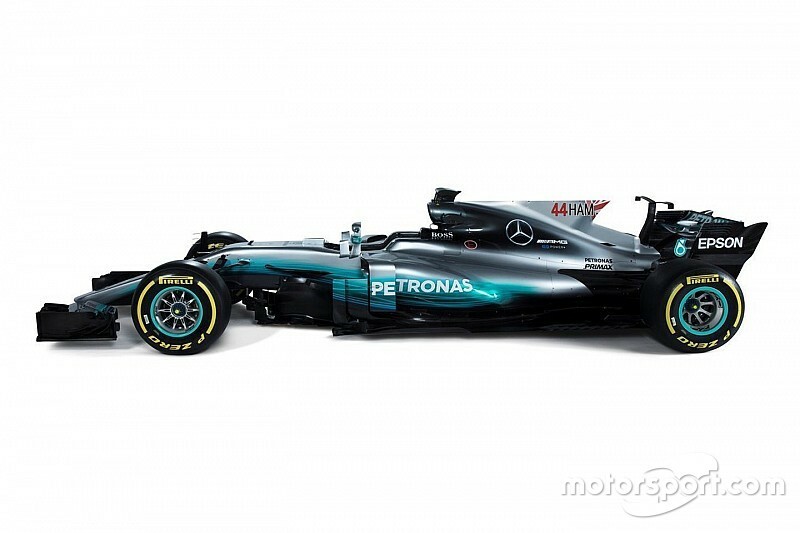 With the Merc the number/name combines with the flag is lost and you would have to be almost on top of it to distinguish any of the three. I suspect that they are going to have to mandate general location and size of the number or just forget it all together. I think I agree - the sideways on shot, it isn't that easy to see. Certainly better than before though. The size of the number is mandated. You sure it's not just a minimum? To the naked eye the numbers on the Red Bull fin certainly look bigger than those on the Merc. Clearer, too. Maybe we will now because they have been so small up until this point. I always noticed Mansell by his number. The old red 5. They need to stipulate a nose position that is visible from straight ahead. Yeah I meant minimum but in the context to the post I was replying to it makes no difference. I like Ferrari's and Mercedes solution but Force India and McLaren's are terrible. Macca has barely any difference and FI's is a badly placed mid sized pink number on pink background. I'd fail them both on the spot for crimes against decals and not taking it seriously. FI have a decent excuse at least in that their car is covered with sponsors just about everywhere but McLaren have no excuse, there's enough room on there to give everyone on the team a bloody number. McLaren. Big picture was annoying me so I've put it in spoiler tags. Last edited by Lotus49 on Thu May 11, 2017 9:05 pm, edited 1 time in total. 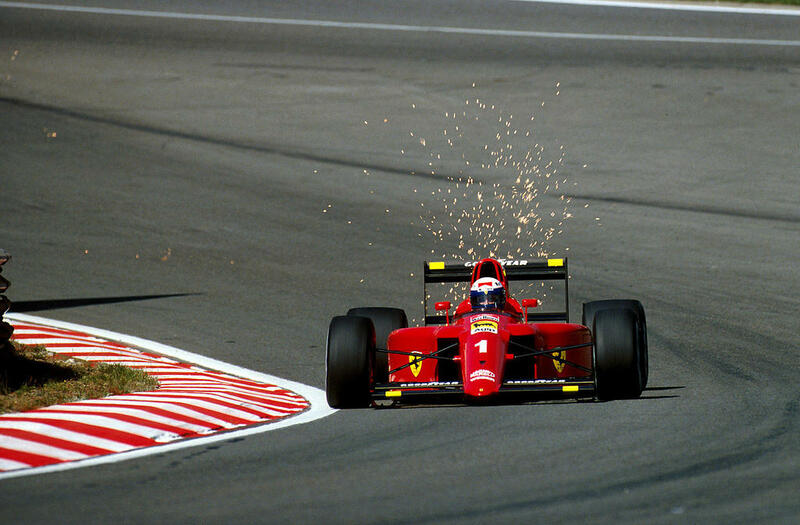 I never noticed the number itself just that it was red, and Patrese's was white. Same with Benetton in their Mild Seven days having the red blob on the nose of the lead driver, and Williams having day glo orange and yellow mirrors/roll hoop cam/front wing supports in the Rothmans years. I'm not even joking, I honestly can't find the number on the Macca side picture. Where is it? 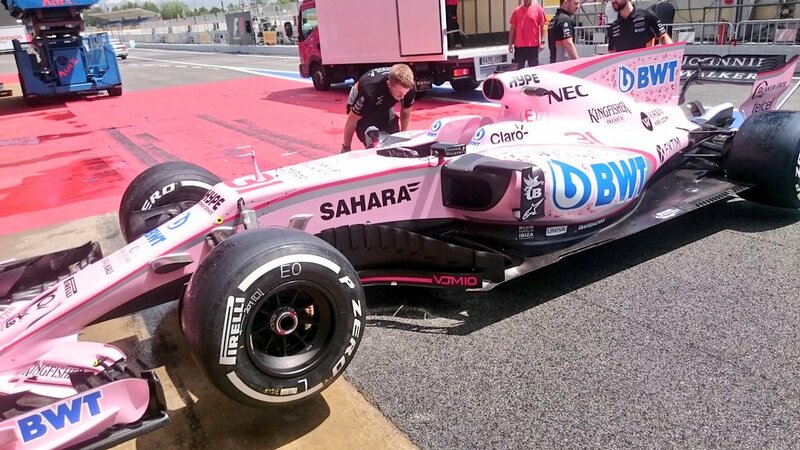 The Force India one is bad, but at least I can see it! Finally someone getting the thing right. Ferrari returned to its historic way to write the number in black on white background. I don't think they have one mate, unless I've missed it too. No names either as far as I can tell. Which to be honest is winding me up even more. Other cars have more sponsors and have found room but McLaren has front and back of the rear wing with just McLaren written on it and bare sidepods. 0/10 for effort, and it looks no different to the last GP. It really is and nice nod to the old cars at the same time. McLaren and FI take note. Incompetency to the highest degree. At that "big" number on the nose is all but visible. Is the Red Bull driver's name Citrix or Aston Martin? Personally, I really don't care if the driver's name is on the car, it is fine if it is, but I think that the number would be the easiest way to make the cars distinguishable unless you want to go back to the mid 60s and do it this way. I rather like the bold numbers of the "old" days, but then that would take up too much sponsor space today. Names and flags are on the roll hoop under the T-cam. No numbers on the side as far as I can see. From what I've seen, some of the teams have tried to put the numbers somewhere on the car that technically follows the rules while not actually helping the fans. Toro Rosso, Red Bull, Force India and Haas might as well not have bothered for all we can see the numbers. Apparently the Williams ones are bad too, but I missed practice, and can't find pictures of it. 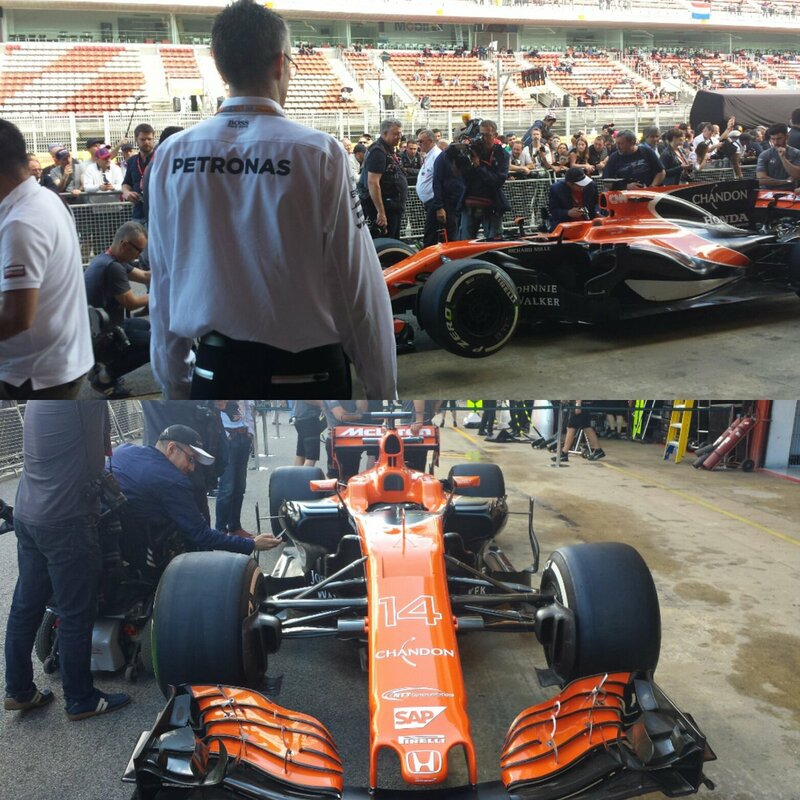 Yeah they were added overnight by McLaren and they filled in the numbers with white on the nose so it looks much better and clearer. RB's numbers on the Sharkfin are pretty visible but agree about the one on the nose, useless position. Yep, that's a classic look. I wish it were back. 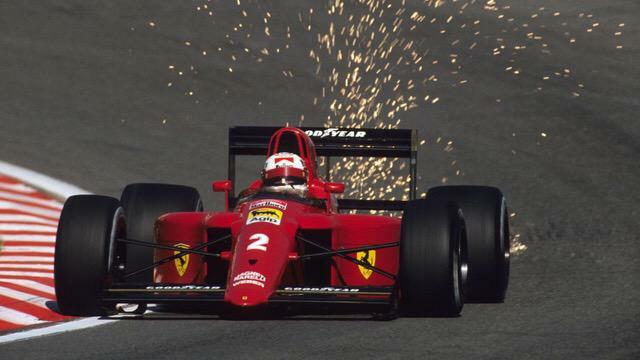 Where is the drivers 3 letter name printed on the side of the Ferraris? I didn't see it on Vettel's car yesterday. As an aside, I can't stand drivers sticking with one number, I feel it insults my intelligence if the reasoning they do it so "the fans don't get confused", which I've heard numerous times. However, my mentality goes back to motocross and supercross, which I followed as a youngster as I raced MX myself. The number that riders wore year to year corresponded to where they finished the year before in the championship. One year Bob Hannah was #100 due to him being injured and missing most of the season. Then he slowed climbed back up before switching to Honda, where was #25, #7, and I think #6. Anyways, I had no problem knowing his number year to year. And I grew up with racing thinking every series needed to abide by this methodology. Obviously, #1 meant something, and it still does. However now motocross has gone the way of everything else and they pick a number and stick with it. It seems unnecessarily arbitrary to me. Bah. I guess I'm really getting old. Not a big deal, just don't care for the numbers staying the same with a driver/rider. All that being said,I applaud F1 making the driver stand out in his car more. I think that it would be even cooler if they livery was slightly different within the team. Kimi has a yellow nose, Vettel doesn't, etc. etc. as a way to enhance who is how without changing it drastically. As the shark fins go away next year, where else do they invade on the car with the three letter abbreviation?